It's that time of year again where the cold, dark, wintery grey days feel like they will never end and we start thinking about sunnier, spring and summer days to look forward to. The time of year where we start trying to find that perfect holiday to book. As a major sufferer of lack of vitamin D (I am a serious summer person), I don't think I could deal with any sort of last minute holiday - I need to know when and where well in advance so I can deal with the crapness of winter, knowing that I will be smothered in some sunshine not too far in the distant future. ANYWAY, I wanted to share what resources I use for researching my holidays, I'm no expert in any way but I always enjoy hearing about what other people look at and sharing is caring right? I love a good holiday and have quite high standards (!) and can spend weeks researching and procrastinating over places, do they tick all the boxes, are the photos deceptive, what are the reviews, is it too quiet/ too noisy etc etc all in the mission to book a fantastic memorable holiday for me and my family, no pressure! Of course things have changed a lot now we have 2 kids in tow, how far we want to go, when we can go (damn you school holidays!) and where. At the moment we are big fans of not travelling too far (although last year we did do 2 holidays abroad) as the kids are still quite young (1 and 4), however this WILL change in a few years but for now driving holidays, Europe, UK and quality villas/ houses are top of our requirements. Right first things first - what is your budget? Sadly our holiday budget has had to change due to having to travel at peak times with the school holidays, so consider saving by not having to book flights and driving instead (although bare in mind how much time in the car you can handle with your kids or travel sickness) . Also consider teaming up with another family/s if you are looking for a villa - it's a great way to stay in a super nice big house more cheaply! If you spend a lot of time at the house with small kids this way you are guaranteed to have entertainment around all the time too and friends to drink with in the evenings when the babes are down. Or in our case, more often than not we take family with us so we can actually get a break whilst we are there. Combining where you stay - for example a few days camping or glamping with a few luxury nights in a hotel at the end could be nice, but camping isn't currently for us. Hotel, B&B or villa? Personally I find a villa/self catering house always works well for us at the moment. A villa is a good option if you are on a budget as you can eat your meals in which saves a lot of money (as does drinking). If money was no issue I would totally stay in a luxury hotel but sadly that currently isn't the case! All inclusive resorts and resorts with childcare are also something to consider, we are yet to try one (watch the space) but have heard good things about both Euro Camp in France and Martinhal Resort in Portugal. 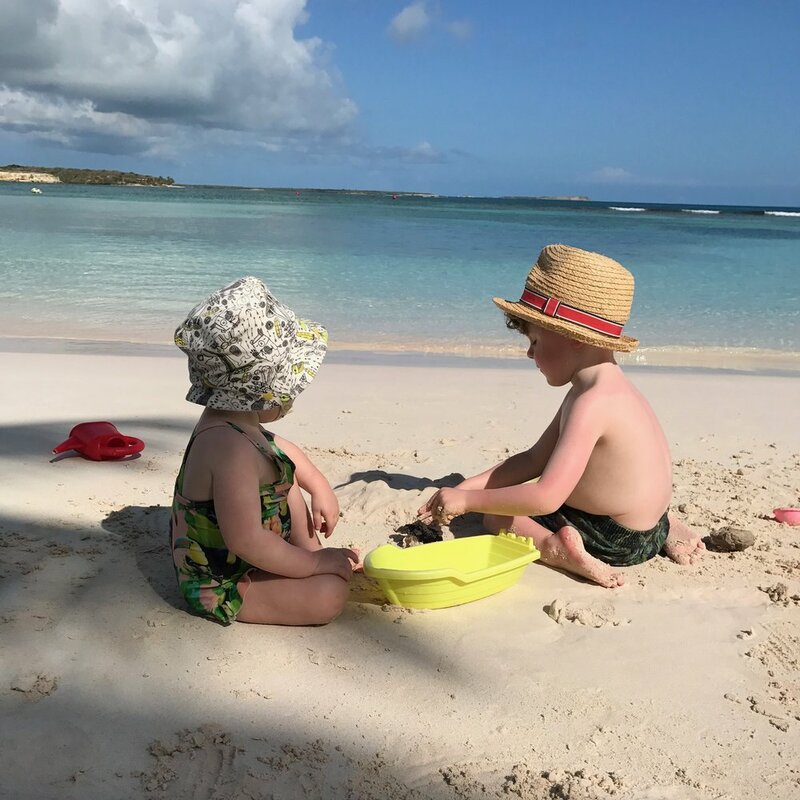 Here are my top resources for researching and planning a holiday with kids on a reasonable budget if you are fairly design and style conscious. Make sure you bookmark what you find or compile a shortlist of places. Also remember if you are booking for peak times the good places do tend to go quick so happy holiday hunting! I used to use this site all the time pre kids and it's so nice to see they have expanded to offer a kid friendly site now too. This is one of my favourite places to look for stylish family places with honest information and reviews, including highs and lows of each place, all actually hand picked and tested by their team. They have hotels, villas and B&B's. This award winning website is super easy to use and has a fantastic filter system making it super easy to search to your requirements - be it by age, self catering or type of setting. There are so many great places to stay and a really good range of budgets too. The best website in my mind for finding unusual and quirky places in the UK and Europe to stay. Think glamping, yurts, cabins, treehouses...if you're after a more rustic experience then this is the place to look. This website has massively grown in the last few years since I started using it (I have stayed in a gypsy caravan on here before pre kids) and I can understand why as the trend for glamping and spending time in the outdoors with your family grows. "When you have kids holidays change so much. I always advise to invest a bit more in your accommodation, especially when you have young children as you spend so much more time in it. Personally, I love finding places with amazing interior design... for me this is now part of the holiday. If the kids are sick or the weather is rubbish at least you get to hang out in a cool space. They don't have to be expensive either, I've found some beautiful self catering houses and apartments on Airbnb and Onefinestay. If you have a bigger budget and want everything organised for you from transfers to nannies then Scott Dunn are experts. Also, just because you're now a parent it doesn't mean you have to kiss goodbye to dreamy holiday locations. I still love finding places in Conde Nast Traveller then researching how we can do it as a family. Don't be scared just go for it." Check out her blog for a load of inspiration and fab places to stay - she is a real expert on Spain especially having spent a fair bit of time out there. I also love her Parent Escapes section. Airbnb is still for me the best way to find affordable houses around the world, be it for one night or one week. It can take a little bit of time to get the hang of as there are SO many properties on there but when you get into the groove of it and use the filters properly there are some real gems to be found. We have just booked 2 places in France on Airbnb for this summer, the reviews look good as do the houses so fingers crossed! Living Architecture have built a series of houses with the aim to promote, educate and influence discussion about modern architecture, and provide an immersive experience through the habitation of spaces, created by some of the most relevant architects and artists working today. Yep if this rocks your boat then read on... We have stayed in the Balancing Barn twice (with babies/ kids) in Suffolk and if you are after a staycation with wow factor then this is the site for you. If you can team up with another family or 2 it makes it a much more affordable stay and I can vouch that the quality of the house and interiors is top notch! You can stay a long weekend or a week (they do last minute availabilitly discounts too) and is a brilliant way to experience some stunning modern architecture. Not all houses are suitable for babies/ young children so please check with them before booking anything! Smith & Family (part of Mr & Mrs Smith) pitch themselves as Family-holiday hotels and child-friendly villas that don't compromise on style, space, or quality time for grown-ups. OK so this is pretty luxury with toppy prices but one can dream right?! They can tailor trips to your party size and budget by talking to their travel experts, again in depth reviews and information on every place they list. Serious wanderlust. If you're looking for architectural escapes around the world and enjoy good design then The Modern House (who sell stunning houses) also have a holiday section. It isn't cheap but if you can travel out of peak season then is where I would look. They have some great UK houses which will of course save on travel. Some of these houses may be more suitable for older children. This website has handpicked kid friendly accommodation for families, many are family homes. Most places are catering for kids making your life much easier by not having to bring so much kit with you - be it a travel cot, high chair or toys. There is lots of information about each place and the area it's in. I'm yet to book anything via this site but it's a good place to go for researching what you can get for your money (please note price filters can be changed to £) and some cool places in different countries. Lastly I wanted to include my current wishlist...some of which I may even have been to already and would recommend or will be trying out this year!